We’re all experienced decision makers. We make hundreds of decisions a day, often without really thinking about it. But in reality, the decision-making process is complex, and many different factors influence the decisions we make. Our family, our values and emotions, advertising, and societal pressure can all influence our choices. Another factor that can influence the way we make decisions is habit. We tend to make decisions in a certain way. It’s called our “decision-making style.” Take this questionnaire to discover your own decision-making style. 1 = This statement is false. 2 = This statement is sometimes true. It depends on the situation. 3 = This statement is true. I make sure that I have all the facts before I make a decision. When I make a decision, I do what feels right. I often ask other people to help me make important decisions. I don’t like making decisions, so I try to avoid it. I make decisions in a slow, logical way. When I make a decision, I rely on my instincts. I don’t make big decisions without talking to other people first. I usually won’t make an important decision until I’m forced to do so. I don’t think too much about the decisions that I make. Making decisions requires careful thought. A decision doesn’t need to make sense – it just needs to feel right. When I need to make an important decision, I like to have someone point me in the right direction. I try to put off making important decisions because thinking about them makes me feel uneasy. When I need to make an important decision, I just do what seems natural at the moment. I consider all of my options before making a decision. I rely on my inner feelings when making decisions. When I make a decision, I rely on other people’s advice. I usually make important decisions at the last minute. 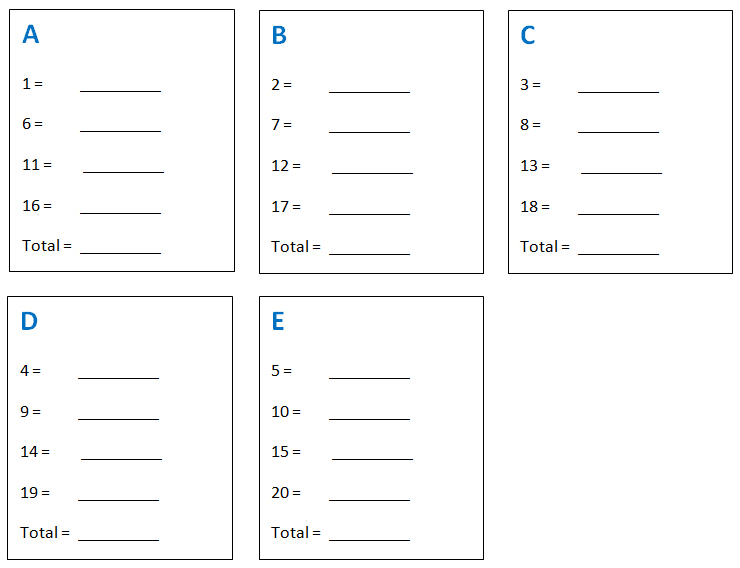 Within each box, indicate the number (1, 2, or 3) that you assigned to the statements on the questionnaire. Then add those numbers up to get a total. Take a look at your total scores. If A is your highest number, you’re systematic. If B is your highest number, you’re intuitive. If C is your highest number, you’re dependent. If D is your highest number, you’re avoidant. If E is your highest number, you’re spontaneous. If you have equally high scores in more than one area, it means that you regularly use more than one decision-making style. You make decisions slowly and carefully. You make sure that you have all the facts before you proceed. You carefully consider all of your options in order to make the best choice. When you need to make a decision, you tend to rely on your feelings. You make decisions based on “hunches” and instinct. You do what feels right at the moment. You find it hard to make decisions without other people’s support. When you need to make an important decision, you ask other people for advice and direction. You’re uncomfortable making decisions alone. You don’t like making important decisions. They make you feel uneasy and uncomfortable. So you try to avoid making decisions as much as possible. You only make important decisions when you’re pressured to do so. You make important decisions quickly and easily. You’re often impulsive. You don’t spend much time thinking or worrying about your decisions. You just make a choice and see what happens. One style isn’t better than another. They each have their strengths and weaknesses, and they each work well in different situations. For instance, the systematic approach would work well if you have a big decision to make and a lot of time to make it. In an emergency situation, it might be better to be intuitive or spontaneous. If you don’t know much about a certain decision that you need to make, it might be good to be dependent and rely on the opinions of others. And sometimes it might be best to avoid making a decision altogether. It’s OK to favor one of these styles more than the others. But if you rely exclusively on one decision-making style, you could end up making some bad decisions. For instance, it’s fine to be spontaneous sometimes – but it’s not the best way to go about making a major life decision. And it’s fine to avoid decisions now and then, but you’re going to run into problems if you avoid them all. Skilled decision-makers are able to use more than one style. They’re able to be flexible, and use the style that best fits the situation. Scott, S. G. & Bruce, R. A. (1995). Decision-making style: The development and assessment of a new measure. Educational and Psychological Measurement, 55(5), 818–831.